Contact Forms offers a simple way for the website visitors to contact your business. It is obvious that your business needs some form of communication channel. It can be a phone, support tickets or a live chat box. WordPress Contact form plugins helps you to have a simple form on your website that will let anyone contact you in a systematized way. Also, it saves time for both the parties. WordPress, on the other hand, comes with a basic contact form feature. It is good, but not adequate. This is where WordPress contact form plugins come into play. There are plenty of WordPress plugins out there, and it will become hard for anyone to search for an ideal one. And, this is where we come in. In this article, we will share Best WordPress Contact form plugins, both paid and free. All the plugins will have essential feature associated with it. However, expect paid plugins to offer better control and features. Let’s get started. WPForms is a drag and drop form builder plugin that is not only easy to use but also powerful in many aspects. It comes with all the features that you will ever need a contact form plugin. Moreover, you get a good starting point thanks to multiple pre-built form templates. The biggest advantage of using this plugin is its feature-rich interface and the ability to create complex forms with payments and instant notifications. It also comes with smart spam protection and provides both honeypot and smart captcha protection. The drag and drop feature is really useful in this contact form WP plugin. With it, you can build forms in a matter of minutes compared to manually coding it. The drag and drop contact form builder is also intuitive. One more aspect of a plugin that impressed us is the support of smarter workflows. This will enable you to decide the flow of forms quickly and divert the user accordingly. With Contact Form 7, you can build the perfect contact form for your website. This contact form plugin for WordPress is one of the most popular plugins out there with over 5+ million active installations. That’s a lot for any plugin out there. It works seamlessly with the WordPress latest version, thanks to the active development team working on it. Contact Form 7 is completely free, and you can create any number of contact forms. Furthermore, each of the customs forms that you create is customizable to the core. You can add CAPTCHA, Akismet spam filter, ajax-powered submit actions, and so on. It also comes with all the form element so that you create something that you require. Ninja Forms is one of the easiest to use drag-and-drop form creators that appeals to both developers and beginners. The plugin comes with built-in hooks, custom field templates, and filters to create the perfect contact form for your page. The plugin comes with a Summernote HTML editor which allows users to customize emails with images, videos and more. With AJAX-form submissions, your website users will be able to submit forms quickly without any page refreshes. Ninja Forms comes with ‘Conditional Logic’ which allows you to show only limited fields to users under specific conditions. It allows you to create smart and interactive forms which feel organized and less clunky than generic contact us pages. Our nextt free plugin of the list is JetPack Forms. JetPack is a package of WordPress plugins where you get a list of features. One such module that it supports is JetPack Contact forms. By using this contact form plugin, you will be able to create forms in a matter of seconds. Also, this module is activated by default. This means all you need to do is open up a page or post in your editor, and you will see the option of adding a contact form. You can work with the basic form or also add new fields as per your requirement. It supports multiple fields including website, address and so on. We recommend using JetPack forms because it is part of the JetPack plugin. This means that you don’t have to install any additional plugin on your website, making it a great choice. If you are looking to create advanced forms, then Gravity Forms is what you should for. Gravity Forms is a paid WordPress contact form plugin and comes with support for 3rd party services including PayPal, Signature, Coupons, and so on. It is a powerful tool that lets you supercharge your contact forms. It is also quick to build thanks to the intuitive visual form editor. This means that you don’t have to write a single code to create a fully-functional advanced form. The plugin comes with 30+ form fields which gives you the creativity and flexibility to create forms. You can also use conditional logic to create your forms. Other key features include file uploads, calculations, email notifications, responsive design, limit & schedule forms and so on. Also, it fights spam. Caldera Forms is a free contact form WordPress plugin that allows users to use a beginner-friendly drag and drop editor to create responsive forms for their WordPress websites. The visual editor allows you to create multiple columns, funnel user responses using conditional logic and also have multi-page forms for your website users. It comes with anti-spam protection built in to keep your database free of bot submissions. This WP contact form plugin is designed to collect robust data and relevant information using your forms. Database entry tracking is available by default to manage your data seamlessly. The plugin comes with a host of built-in form templates to help users with no coding skills get started with the grid-based form builder in seconds. 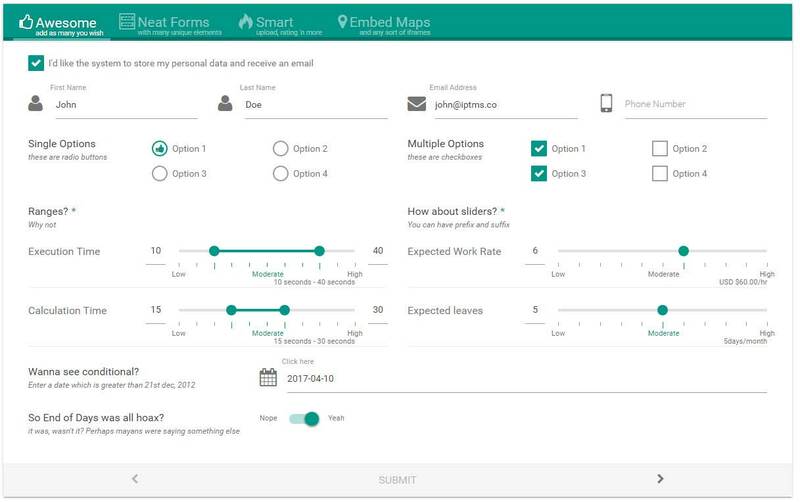 Caldera Forms offers rich customization features and add-ons which can be used to make user-friendly forms. QuForm 2 markets itself as one of the most advanced form builders out there and for a good reason. If you want to create effective forms that are efficient at collecting information and do not take up much of your audience’s time, it is one of the must-have tools for any WordPress website. This contact form builder plugin offers users the ability to make plugin forms with total control. It can be used to create a variety of forms including booking forms, quotations and more and all of them can be built without learning a single line of code. It has drag-and-drop form building with one-click functionality to help out beginners. Pirate Forms is another free to use WordPress contact form plugin. It offers excellent feature-set when it comes to creating contact forms. However, the plugin will not act as a drag or drop solution or not a form maker. It is a simple-to-use plugin that let you instantly create a form without worrying too much about the creation and customization process. To use it you need to use the [pirate_forms] shortcode in your page/post. The key features of the Pirate Forms are reCaptcha, SMTP support, special databases contacts and much. You can also try out their PRO version that offers the option to add multiple forms, custom fields, newsletter integration! If you are looking for a complete package, then Formidable forms can be your best bet. By using it, you can not only create contact forms but also create surveys, polls and other forms of lead generation forms. Using Formidable forms is easy as you can start building the forms using a template. Furthermore, you can always create a fully featured custom form if you want to! 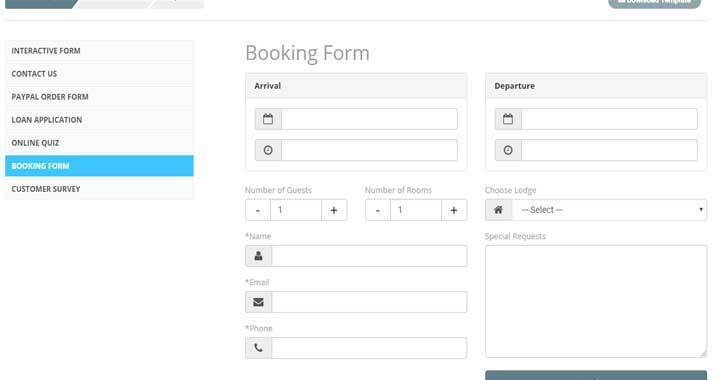 With formidable forms, you don’t have to write a single line of code to create a form. It should also be noted that all the forms that are created using the plugin are responsive and works as intended for any screen size. You can also do advanced customization and change the HTML or CSS if you know what you are doing! Some key features of the plugin include support for all the form elements including radio buttons, checkboxes, user ID, hidden fields and much more. It also supports reCaptcha. Overall, a great plugin with decent customization and pre-build form templates. FormCraft is a premium WordPress contact form plugin. It lets you build amazing forms. Also, you can create them using the drag and drop feature without any need to code. The navigation seems to be simple and intuitive which makes FormCraft easy to use. You can create modern forms using the drag and drop builder. Moreover, this WP contact form plugin is feature rich and scales with your app solution or website traffic. To get started, choose any of the included templates and start tweaking them. You can also add multi-page forms. However, this feature only comes with the add-on that you need to get from their shop. This contact form plugin for WordPress supports responsive designs. It also comes with a dozen add-ons that improve the plugin’s functionality. Moreover, you can use advanced logic. It comes with 17+ add-ons, and all of them are free! However, it does comes with paid add-ons as well. You can check them out on their plugin page. e-Form is yet another premium WP Contact form plugin that offers a complete solution when it comes to creating forms. With e-Form, you can create full-fledged forms that can be used for surveys, data collection, quizzes and so on. One of the cool features of the plugin is the payment estimator that can estimate payment according to the user requirement. Just like any other form plugins, it supports responsive design, a form builder, automated quiz system, survey system, and so on. Contact Form by BestWebSoft is a free-to-use WordPress contact form plugin that offers good features. They also offer a PRO version. However, if you are creating basic forms, you won’t find the need for the PRO version. To use this contact form, you need to use the shortcode and paste it into any post, page or widget. The choice is yours! Furthermore, you can customize the form with pre-build options. The free features include responsive layout, file attachments, pre-build fields, two column layout, contact form reCaptcha and much more. The plugin also supports custom code customization using the plugin settings page. The free version should do more than enough for your website, but if you need more, you can always choose the PRO version which offers more control over the free version. You can check out the PRO version here. Visual Form Builder does exactly what the name suggests, allowing users the ability to build and manage all kinds of forms for their WordPress website using a visual interface. You can create fully functional forms without requiring to write a single line of code. A pro version of this contact form WordPress plugin is also available with added functionality. Plugin users can add form fields to their websites with just a single click and a drag-and-drop interface. An anti-spam system is included in the plugin to prevent bot submissions which can clutter your data and give you a hard time. All of your entries can be managed using the WordPress dashboard, allowing you to access your form data whenever you want. Form Maker is one of the most powerful tools that allow you to create complex contact forms with the least bit of hassle. The form builder plugin has an intuitive UI to help you create forms without spending more than a few minutes on the dashboard. You can create forms, questionnaires, surveys and a lot more. To simply things for your users, you can have conditional fields, captcha protection, and eye-catching themes to make your forms more attractive. This form plugin is compatible with any WordPress website and has a lot of stylized themes to help you get the look you want out of your contact form. Next Forms is is a complete form building plugin with tons of features. You got to choose form 30+ form fields, 70+ animations, 44 preset colors and so on! As usual, it comes with drag and drop builder which makes it easy to create complex layouts. It supports match and conditional logic as well. You can also create interactive forms using the Nex Forms. It also supports responsive design and other key features such as built-in spam, pre-populate fields and so on. 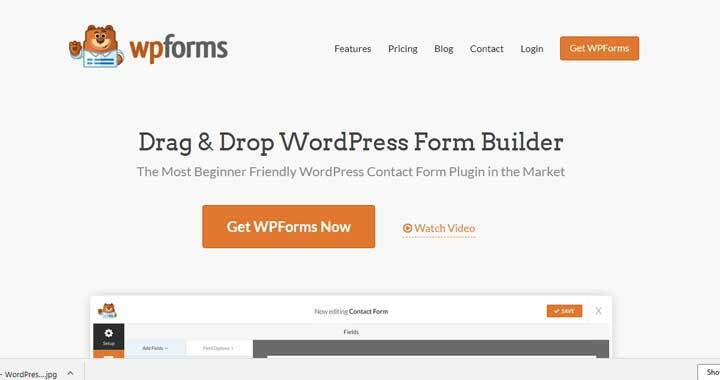 ARForms is one of the top selling WordPress form builders this year due to its ability to create WordPress forms in a matter of minutes. With no coding experience or design skills needed, the plugin offers a host of pop-up forms that are capable of offering solutions to all kinds of website owners. The simple UI is designed to offer users a real-time experience and has powerful features that you can use to create and process forms quickly. With a multi-column feature and resizable fields, the plugin is flexible and easy to use for any WordPress website owner looking for the right form tools. Having a functional and user-friendly Contact Us Page is important for any WordPress website. Contact Form Builder is designed to help users with no coding knowledge with building forms for their websites. The plugin is available for free with an optional paid upgrade to access premium features. It offers a host of useful features including export/import capabilities and responsive contact form design. There are no limitations when using the free version of the plugin with the ability to create an infinite number of fields in your Contact Us forms. It also comes with security features including password protection and ReCaptcha fields to keep bots away. Contact Form Builder also comes with more than 25 themes and 37 animation effects to help you customize your forms. 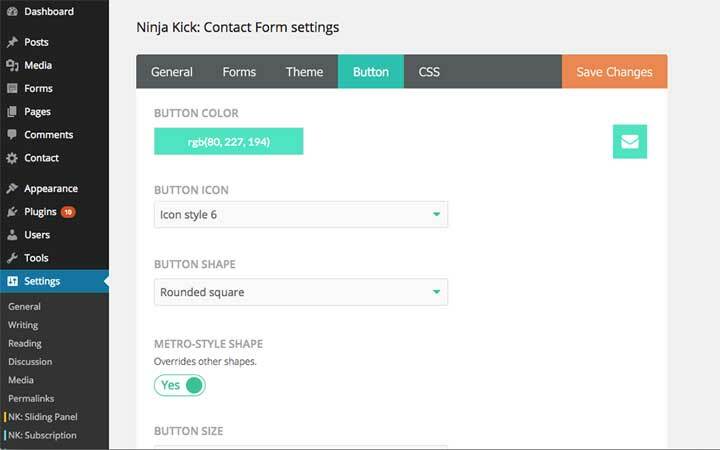 Ninja Kick is one of the most intuitive WordPress contact form plugins that allows users the ability to access contact forms without leaving a page. The plugin offers a pop-up contact form that is hidden in every page and simply clicking a Contact button will bring the contact form up instantly. The plugin makes it easy for users to get in touch with the website and submit any queries. You can place a floating button anywhere on the website. It comes with three themes and a social bar to help your users get in touch with you on your social media accounts. weForms is one of the fastest to use WordPress contact form plugins that offer breakthrough performance. It is an all-in-one solution with a minimalistic and highly effective design. All of the setups can be done on a single page using the plugin’s dashboard, and it allows you to create user-friendly forms super-fast. The plugin allows you to create unlimited forms using a host of customizable and predefined templates. The drag and drop builder is easy to use and offers a real-time preview option, so you can see what your form will look like once published to your WordPress website. It also offers slack integration for added productivity features. HappyForms is one of the simplest ways to manage your conversations with your viewers. It is one of the oldest plugins, making it one of the most reputed form builders out there. This contact form WP plugin is free and user-friendly, allowing users the ability to increase conversations and website visitors. You can set up highly functional contact forms in a matter of minutes, and you have access to a filterable archive to collect and manage your user data. The live preview form builder makes it easy for you to see what your form will look like even before you publish it. Any Other WordPress Contact Form Plugin? So, which one you need? It all depends on what you are looking for. If you need a simple WordPress contact plugin that merely lets you create a form for basic contact functionality, go with any of the free plugins listed above. However, if you are trying to capture information related to other aspects of your business, then a paid plugin is your best bet. Do let us know in the comment section below of what do you think about the list. We are listening.